Sloths, members of the order Pilosa and related to anteaters, are some of the world’s slowest mammals. They are categorized in two families: Megalonychidae (two-toed sloths) and Bradypodidae (three-toed sloths). Despite this taxonomic distinction, all sloths have similar life cycles. The gestational period varies slightly from species to species. The pale-throated three-toed sloth (Bradypus tridactylus) has an average gestational period of four and a half months, the pygmy three-toed sloth’s (Bradypus pygmaeus) is six months (see ref 5) and the Hoffmann’s two-toed sloth (Choloepus hoffmanni) gestates for a period of 11 and a half months. On average, all sloth species give birth to a single offspring once each year. 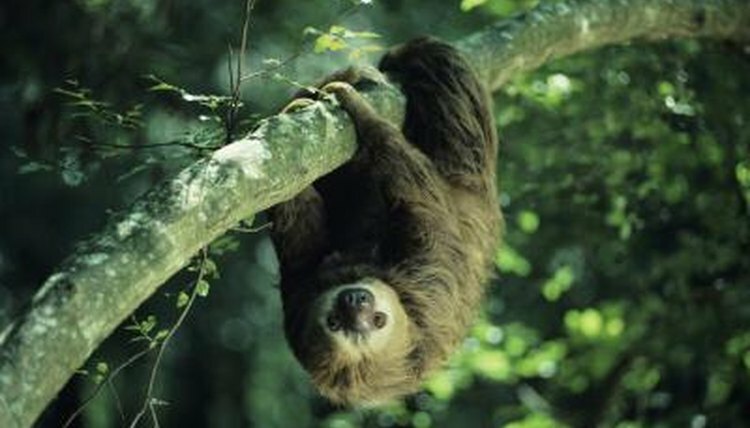 Built for life in the trees, sloths mate and give birth in the treetops and often upside down. During the precarious birth, the expectant mother pulls the infant from between her hind legs while other sloths aid in cleaning the upside-down infant and ensuring that it does not fall. Newborn sloths are small—the average new Hoffmann’s two-toed sloth weighs 14 ounces—and they cling to their nearly stagnant mother’s belly for a period of weeks or even months before they have the strength to move on their own. Young sloths rely on their mothers for nurturing, protection and food; male sloths do not assist in child-rearing. After the infant stage of belly-to-belly nurturing, the young sloth begins to feed on foliage itself. A juvenile maned three-toed sloth (Bradypus torquatus) remains with its mother for up to a year, while she carries it during her feeding and travel. The brown-throated three-toed sloth (Bradypus variegatus) stops clinging to its mother after weaning, around 4 months, though the mother still aids in learning and exploration. All sloth species sexually mature between the ages of 2 and 5 years. A female Hoffmann’s two-toed sloth reaches sexual maturity at the age of 3 and males mature between the ages of 4 and 5. A full-grown, sexually mature Hoffmann’s two-toed sloth weighs between 8 and 18 pounds and measures around 25 inches long. The maned three-toed sloth matures a bit earlier than its cousin. Males and females alike become sexually mature between the ages of 2 and 3 years, when they reach full-grown adult size and their reproductive organs have developed accordingly. Smaller than the two-toed sloths, an adult maned-three toed sloth weighs roughly 8 pounds and measures around 18 inches long. Life expectancy varies slightly among sloth species, but most live on average 20 to 30 years in the wild and a bit longer in captivity.